Ideally positioned in the heart of the dynamic district of the Saint-Lazare railway station, the office complex has been entirely restyled and renovated to make it modern, innovative and functional, while importantly respecting its urban environment and its history. ASA studio used a different approach for each of the three buildings according to their typology. In order, these were a 1930s building, a mansion from the 1840s and former stables of the 19th century. The outcome led to the creation of one new construction and a major renovation and restructuration of two historic buildings. 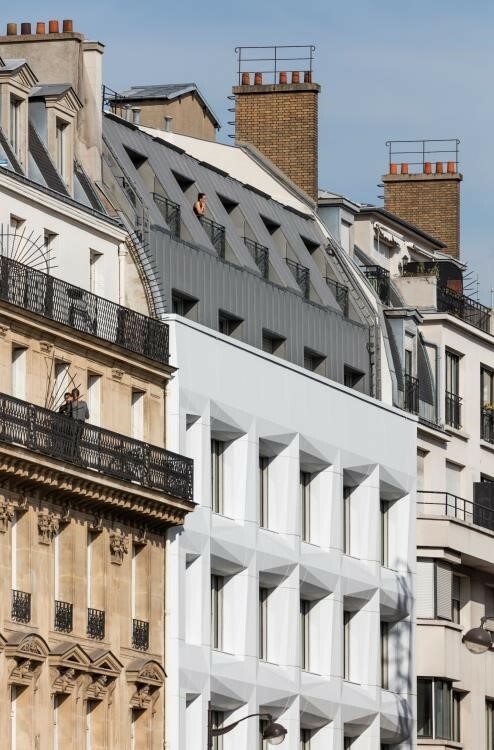 The main challenge was to give the spaces a balanced symmetry, that was fragmented due to a succession of different architectural and historical sequences, and to provide a strong overall identity, especially for the façade on rue de Londres. The sequence can still be seen in the alternating voids and solid spaces that distinguish the compound. The outline from South to North sees the facade and a first 6 storey building, a courtyard, a second building (the old mansion) with a plant-filled courtyard, and lastly the old stables. A staircase was built to connect the two structures and streamline the flow of people on the move. 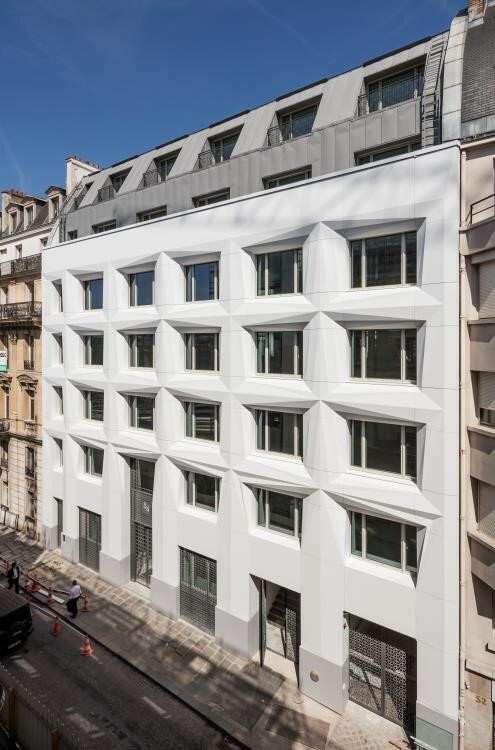 By creating a sculpted 3D appearance, ASA studio wanted to add value and give new life to the imposing façade on rue de Londres. The idea was to use a geometric patterned cladding resembling an Origami, the Japanese art of folding paper. 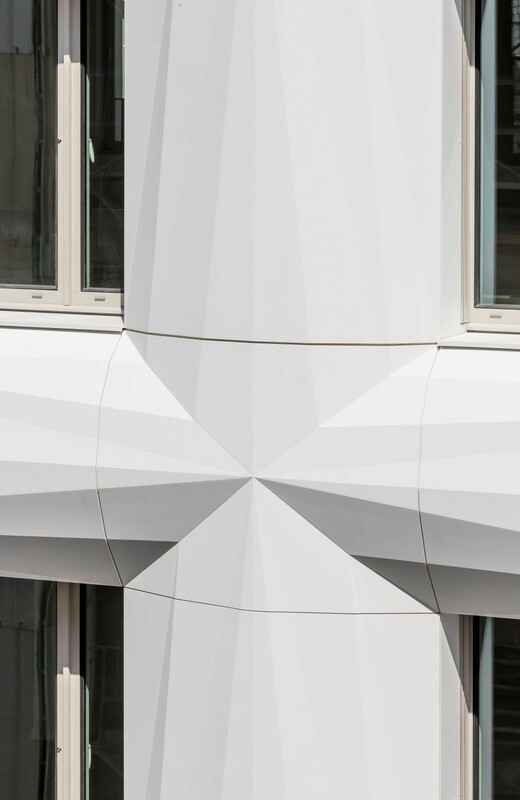 The exterior cladding was developed using Corian® Exteriors customized panels based on Corian® Solid Surface in Glacier White colour. 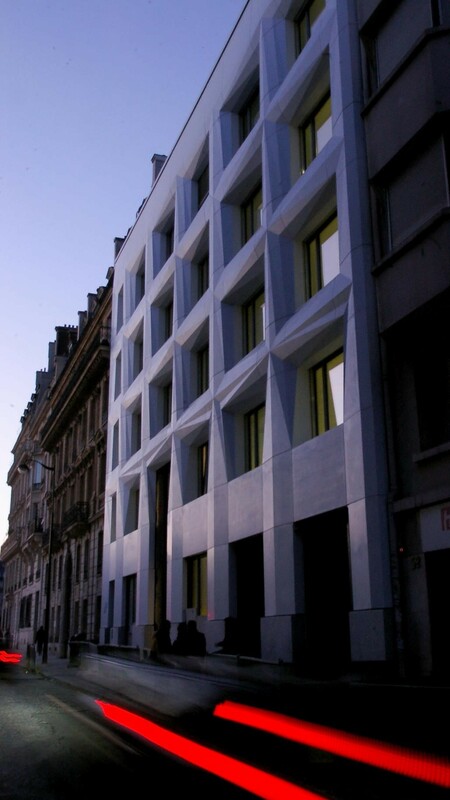 The proportions reflect the balance of an urban layout by Haussmann and give the building a look of solid mineral, vibrating with light. It is the first façade of its kind ever made in France. 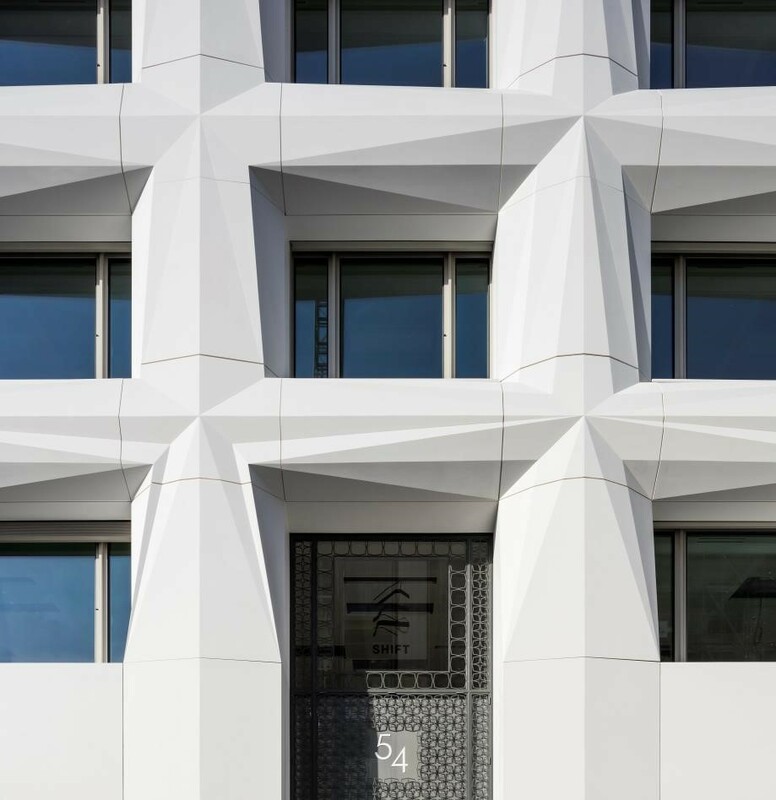 ASA studio chose Corian® Exteriors panels based on Corian® Solid Surface because of their aesthetic properties, design versatility, durability and cleanability. The sustainable properties of the ventilated façade provide thick insulation for an optimum thermal efficiency and minimum energy cost, in compliance with the new environmental regulations.Corian® Exteriors solutions area increasingly used for façades due to their resistance to difficult weather conditions, UV rays and good performance in case of fire. Its homogeneous colour and unique appearance create unexpected and fascinating interactions with light. The layout of the interior spaces was redesigned to respond to new working methods that require comfort and performance for its users. The materials (glass, Corian® Solid Surface and wood), the finishes and the colors perfectly combine with the ergonomic and sustainable essence of the design. 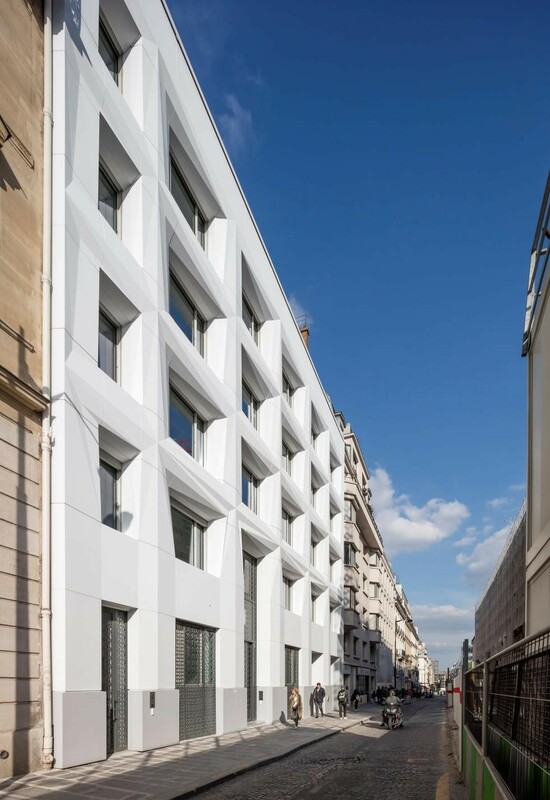 Spreading over approximately 5,000 square metres, the compound includes co-working platforms, leisure areas, private offices, meeting rooms and terraces overlooking the Eiffel Tower and the Western Paris.